SILICON SLOPES, Utah – March 22, 2016 – Today at Domopalooza, Domo announced Domo Mobile, a radically new mobile experience that’s been three years in the making. 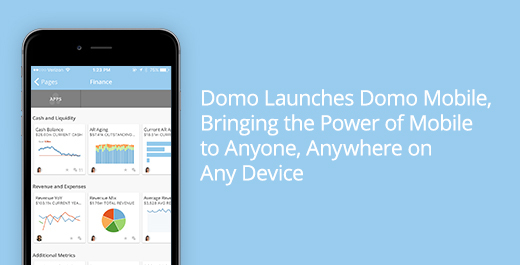 Domo Mobile brings the power of the Business Cloud to decision makers anytime, anywhere, on any device. It is delivered via native iOS and Android apps and Mobile Web. Combining rich enterprise functionality for data-driven decision making with an enterprise social network, Domo Mobile makes it easier than ever before for users to run their business from their phone. With Domo Mobile, users can personalize how they view the apps and metrics that are most important to them for managing their business. Domo Mobile also lets them do live data exploration, see what metrics are most important to others in their organization, know what conversations are trending, look up people in their organization, and keep business moving through business workflow features such as projects and tasks. For more information about Domo Mobile, visit domo.com/Mobile.